We’ve all heard about the importance of knowledge sharing within an organization. Among all benefits, a great knowledge sharing system can have valuable impact on the quality and efficiency of workflows, and strengthen the trust and communication culture within the organization. Having these in mind, we at FELD M make sure our knowledge sharing process is as smooth and gainful as possible. 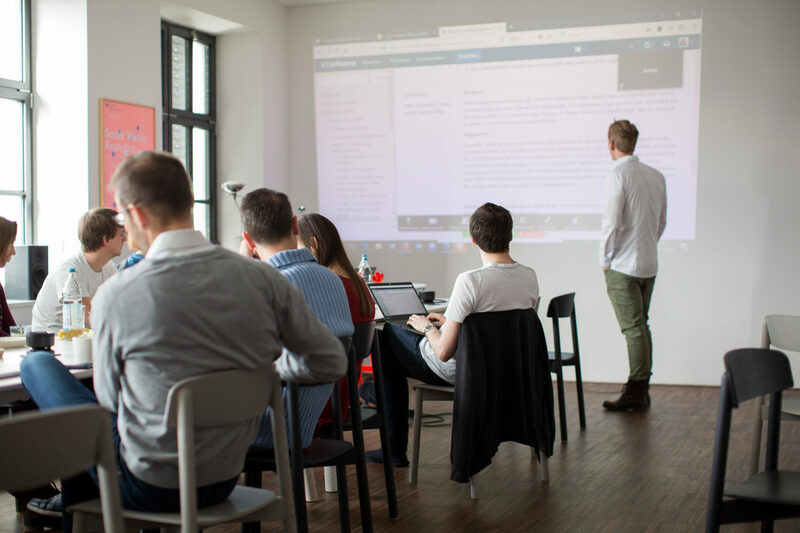 There are of course various methods empowering knowledge sharing in FELD M: take our “open space office” and “flat hierarchy system” as a few examples. However, there’s something new going on for a while here at FELD M which we’re pretty excited to share with you. The idea initiated when our analytics’ team members felt the need of a process which enables them to learn an additional skill or tool which could ultimately affect their working life. The existing methods were not capable in nature to allow such exchange of knowledge. That’s when we came up with a new process which we take so much pride in. 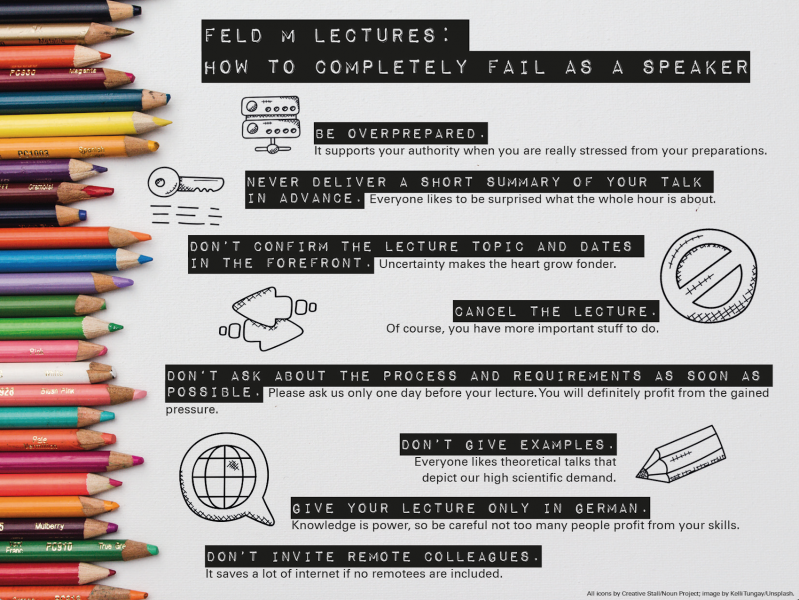 It’s called the “FELD M Lectures”, and it’s been going on since January 2018. As you can already guess from the name, we, and by “we” I mean all FELD M colleagues, hold a lecture for the entire company once we have something valuable to share. Now this might sound a bit daunting at first, but believe me, it’s anything but that. Our lectures are held in a relaxed easy going manner, ensuring that we don’t avoid having them by overengineering the process. So basically, yes, we have a “presentation”, “small talk”, “get together” with the whole company and share our valuable thoughts, skills or knowledge with each other. How great is that? Considering the purpose of the lectures, the topics may range from analytical tools to basic knowledge of the “internet”. We’ve even taken the topic range to a whole new level, and share aspects regarding cultural differences and diversity due to our international background. All in all, the primary goal is to introduce different topics in short and informal lectures (e.g. based on FELD M services, current projects, tools or methods) in order to assist employees in evaluating whether the topic is a subject which they would like to get more involved in at work. If a lecture topic generates demand for more detailed information, then more extensive courses (internal or external) are organized. The lectures are held every 2 weeks, and the speakers may present their topic in any format they prefer. After passing the initial weeks of enthusiasm into our “newly born”, however, we realized that a proper team needs to take care of the process, and make sure that we remain on the right track. Therefore, we now have the “FELD M Academy” team taking care of the lectures’ time table, process and motivation among colleagues. The team’s responsibilities have now expanded to FELD M Courses (! ), and other tasks which we would get to later. For now, let’s just say our team has come to such high level of collaboration and motivation to exchange knowledge that we decided to share it with you and hopefully inspire you on your knowledge sharing journey.